New York Comic Con has come and gone, but not without showcasing a few upcoming works by one of our favorite authors. 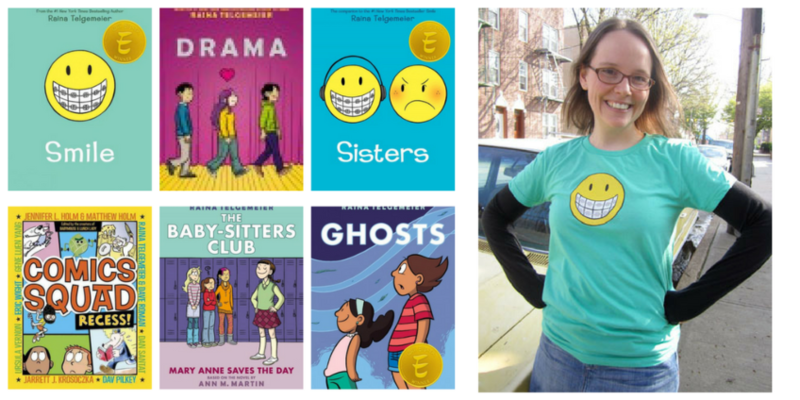 Raina Telgemeier, the author of Smile and Sisters, revealed her two new upcoming projects that will be released in 2019. Share Your Smile, is a how-to-make-comics journal and guidebook, providing potential comic book artists with tips and tricks on how to get into the comic book drawing business and come out like a pro. Her other upcoming novel, Guts, is a graphic novel and a memoir based on the author’s middle school experience. Taking place before Smile, it focuses on the author’s experience in dealing with her anxieity disorder during fourth and fifth grade. The book goes into detail about the author’s difficulties in dealing with her anxiety, panic attacks, and phobias. Raina Telgemeier balances the serious topic of mental health in a charming yet comical way for middle schoolers to understand and relate to.